Britain Goes After Pot Growers With 'Scratch And Sniff' Cards : The Two-Way More than 200,000 marijuana-scented cards are being sent out to help educate the public on the smell of cannabis. A drug-sniffing dog checks for illegal substances at a London train station in 2007. 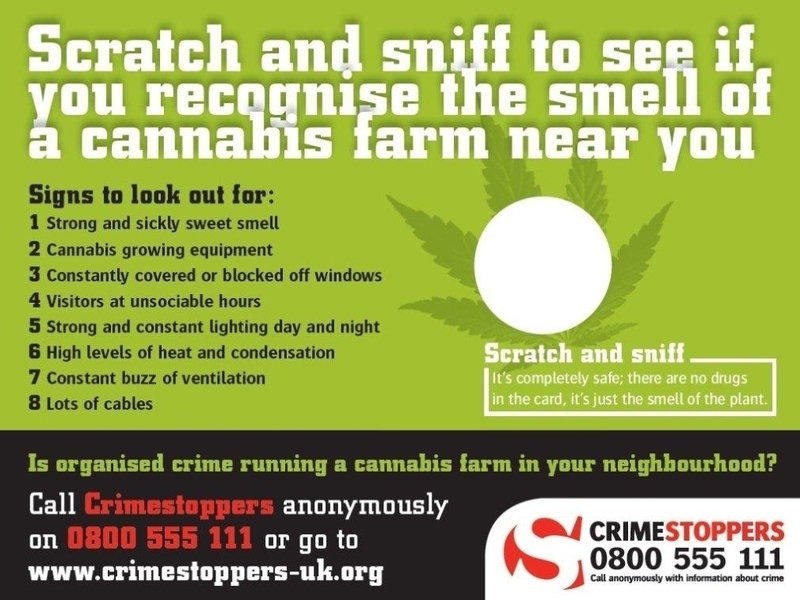 British police are now issuing "scratch and sniff" marijuana cards in hopes of educating the public on the smell of cannabis plants. 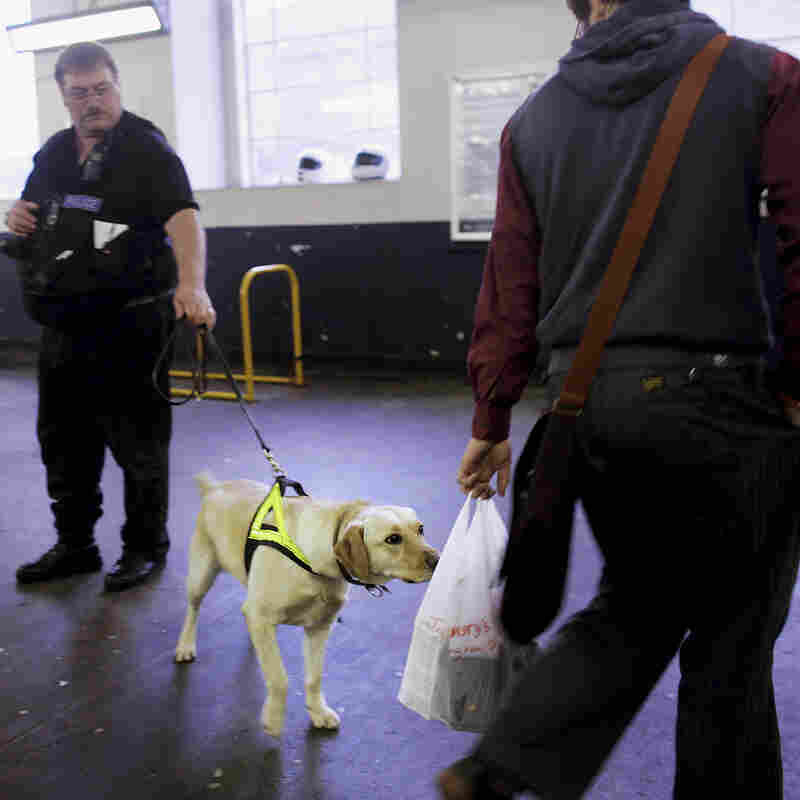 For many years, across the world, the extraordinarily powerful noses of dogs have been successfully used to help detect crime. Now, in Britain, moves are under way to recruit humans to perform the same subtle work. Police are encouraging the British to step out of their homes, raise their nostrils aloft, and see if they catch the whiff of wrongdoing wafting from the next-door neighbors. Visitors to these crowded islands are often charmed by the small redbrick terraced houses that are in every town and city. But law enforcement agencies here say the attics and backrooms of some of these homes conceal illegal urban microfarms in which criminal gangs are cultivating marijuana for commercial sale. They want the British public to sniff these out. To perform this task, humans — like dogs — first need a little training. So a crime-fighting charity, called Crimestoppers, and police are this week sending out more than 200,000 "scratch and sniff" cards to households around the country. They want to educate the national nose. The British generally need little assistance detecting the presence of a smoldering joint. Millions of them use, or have used, marijuana. They know very well what it smells like, once alight. British police and the volunteer group Crimestoppers are sending out more than 200,000 of these cards with the scent of a cannabis plant. These scratch cards are intended to teach them how to recognize living cannabis plants. Scratch, sniff — and there it is: the strong sweet smell of cannabis while it's actually growing. "We are distributing 'scratch and sniff' cards because not many people know how to recognize the signs of cannabis cultivation happening in their neighborhood," says Roger Critchell, Crimestoppers' director of operations. He adds: "Many are also not familiar with the established links between this crime and serious organized crime." Statistics suggest there has been a sharp rise of cannabis farms in Britain in the past year or two. It's a fair guess that this may be a side effect of prolonged economic stagnation. In Humberside — part of northern England that includes some of the country's most depressed areas — police busted 18 farms in 2007-2008. Four years later, that number was up to 148. The numbers are surprisingly high in some places. In West Yorkshire, police found nearly 1,800 cannabis farms in just two years. Who knows whether "sniffer humans" will make any difference. They have an incentive: Informants get a reward of around $1,500 if there's an arrest. Yet this is complex terrain. Many in big cities tend to take a liberal view of soft drugs, especially for personal use. Narcotics are weaved into the tapestry of the history of the British: Fortunes were made in the late 18th century when their monopoly on the opium trade secured control of the Indian subcontinent. Plenty of British national "treasures," past and present, have had a puff or three. The British also have a pleasingly droll and subversive sense of humor. The first fruits of the scratch and sniff cards are jokes — about "grassing on the grass growers."